USDJPY is under the influence of Japan national base index of the consumer prices and Yellen’s speech. This pair is moving with bullish bias continuing the sudden growth to 102 area. The support rests at 101.780 with resistance at 102.500 which both lines are above the weekly pivot point at 101.260. The EMA of 10 is moving with bullish bias and it is crossing the EMA of 100. The RSI is moving on overbought area, the Stochastic is reaching its maximum amount and the MACD indicator is in positive territory. 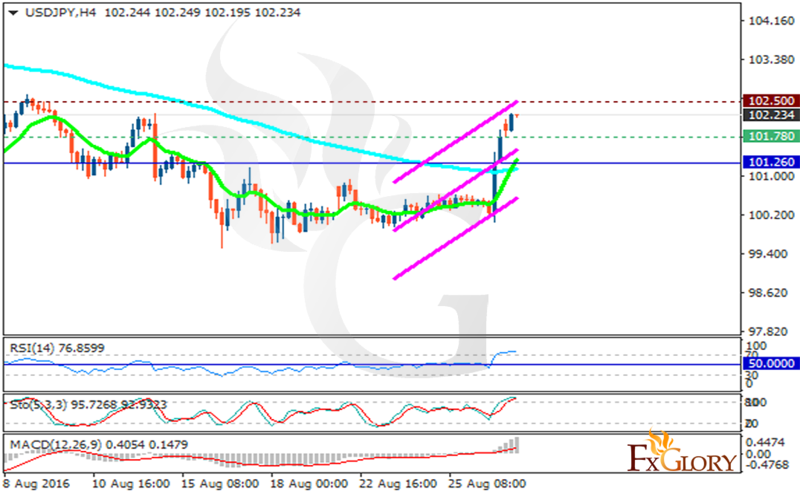 The resistance level breakout will pave the way for further growth targeting 102.64.